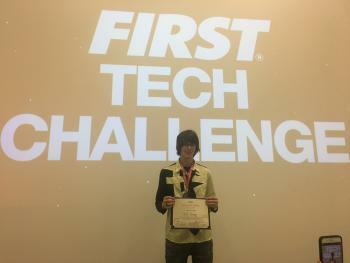 Mark Herndon a Junior at Kelton ISD has received the FTC Dean's Award for the second time in a row. This is a prestiges award, awarded to the highest scholars of FTC Robotics. Mark has demonstrated great character, and leadership on his FTC teams the last four years. Only three FTC members from the panhandle continue on to the world FTC Robotics championship in Houston to compete for the top ten recipients of the Dean's Award. Dean Kamen will present the top ten finalist their awards as well as several prestige engineering scholarships at the world FTC Robotics Championship.